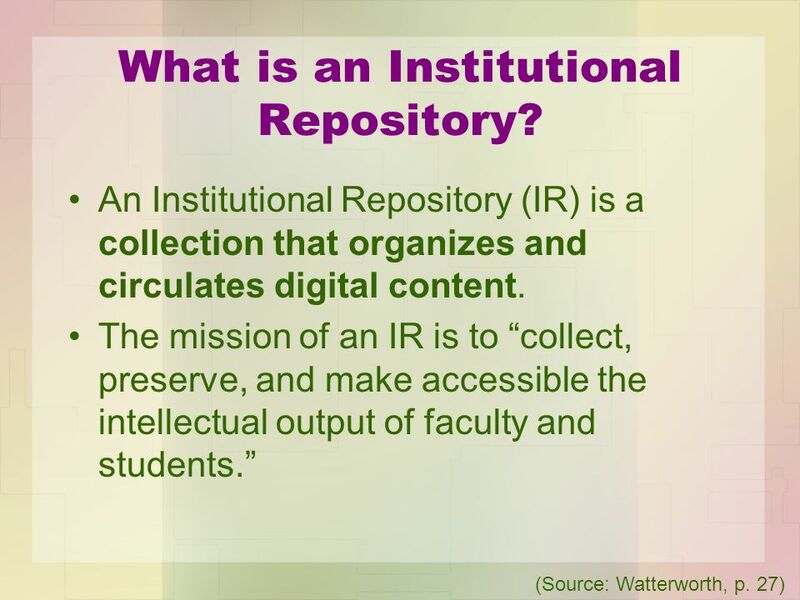 3 What is an Institutional Repository? 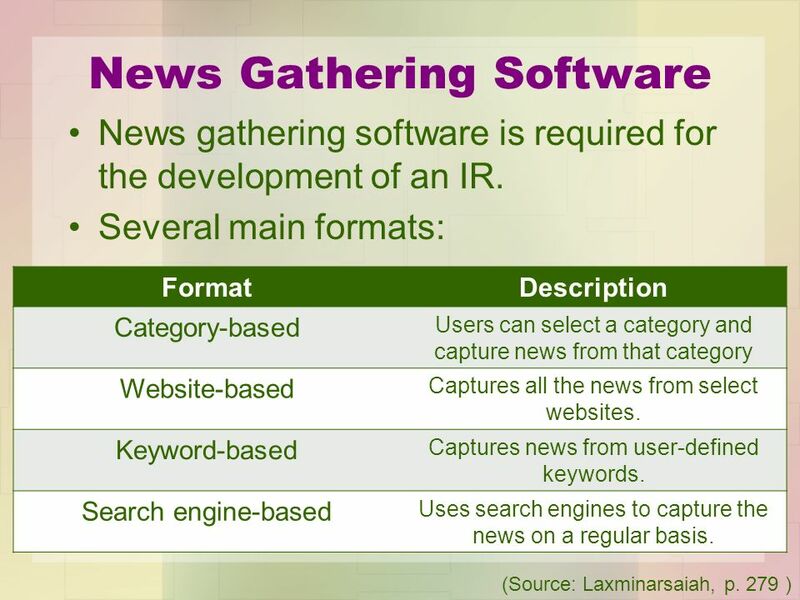 “Supporting digital publishing initiatives” “Aim for the preservations of content” (OASIS, 2009) They are also important for the management and dissemination of knowledge and are becoming popular vehicles for open access trends in academia. 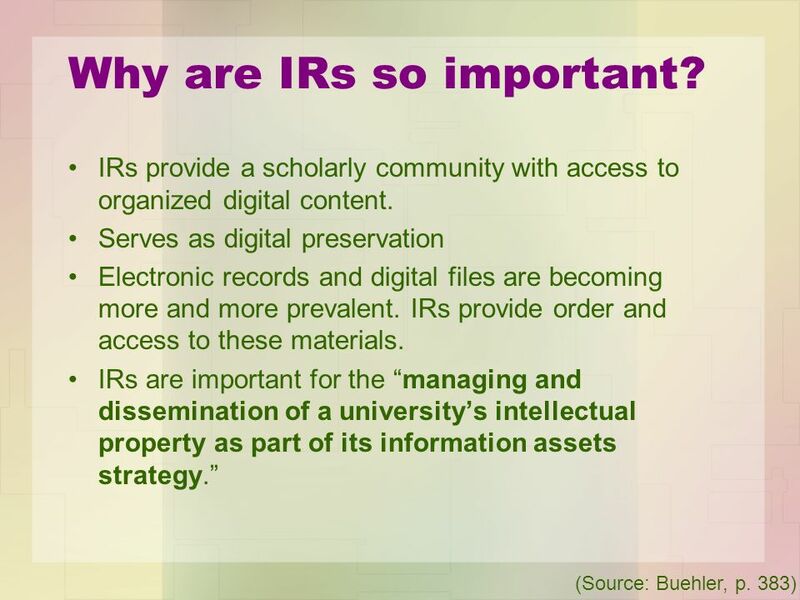 5 Why are IRs so important? 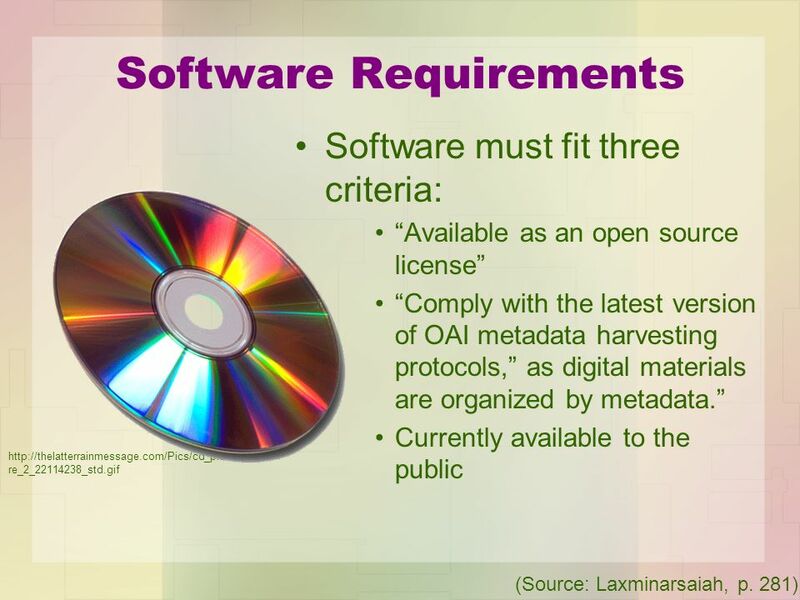 A variety of software & data management tools are needed. 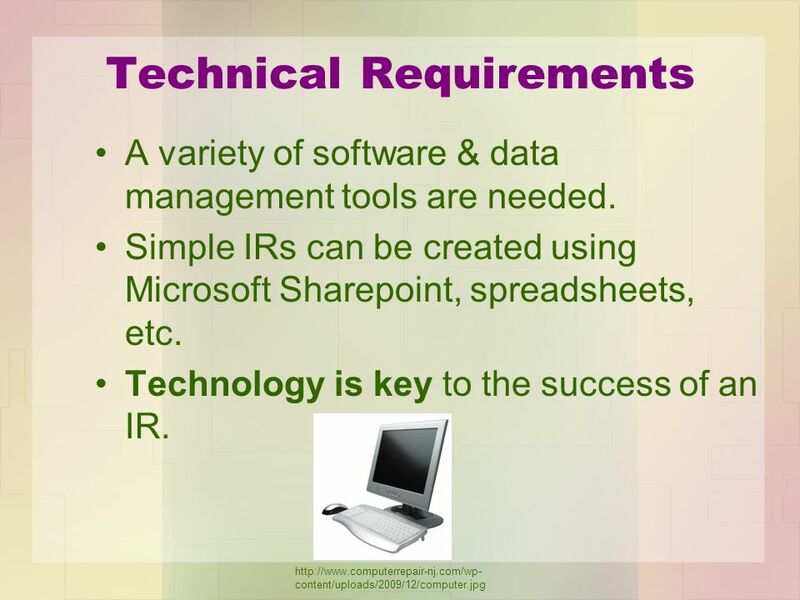 Simple IRs can be created using Microsoft Sharepoint, spreadsheets, etc. 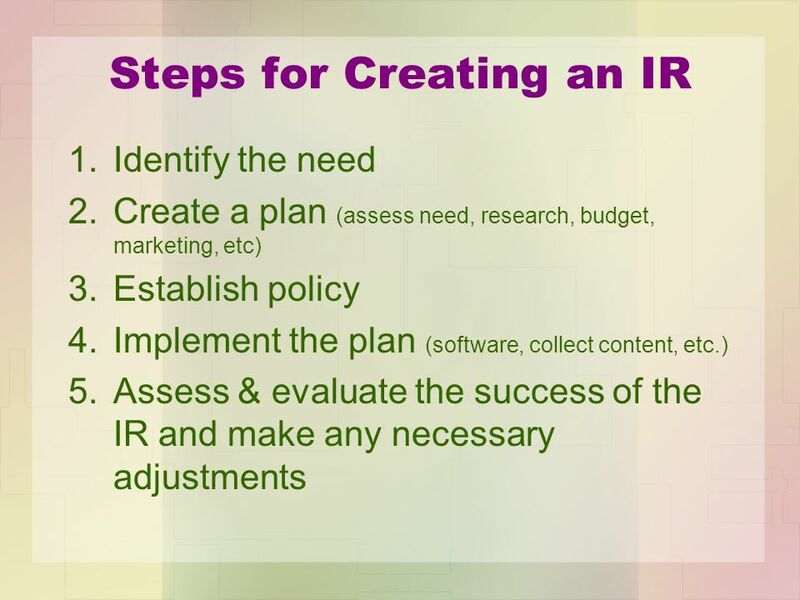 Technology is key to the success of an IR. 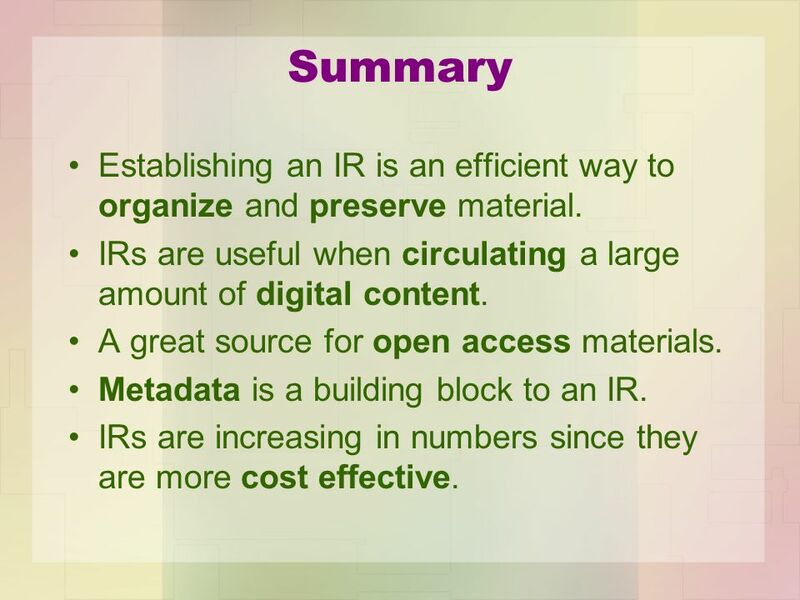 28 Summary Establishing an IR is an efficient way to organize and preserve material. 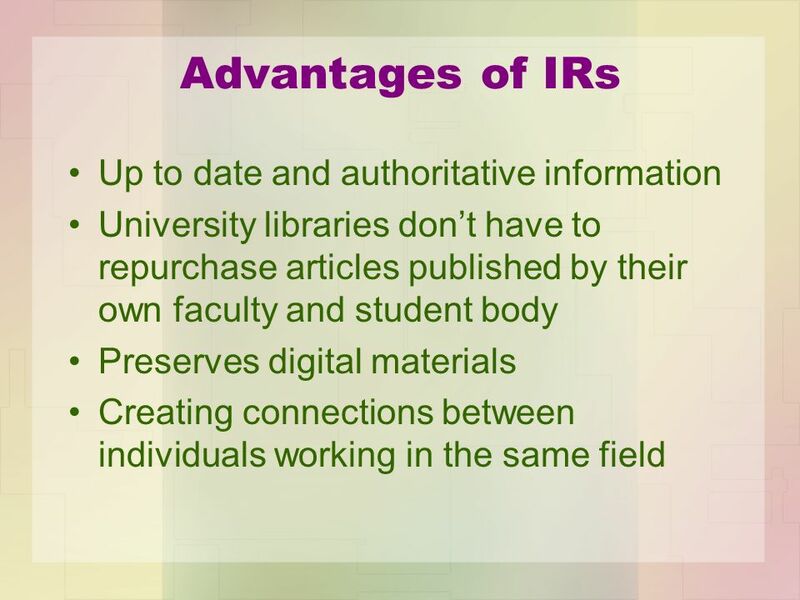 IRs are useful when circulating a large amount of digital content. A great source for open access materials. 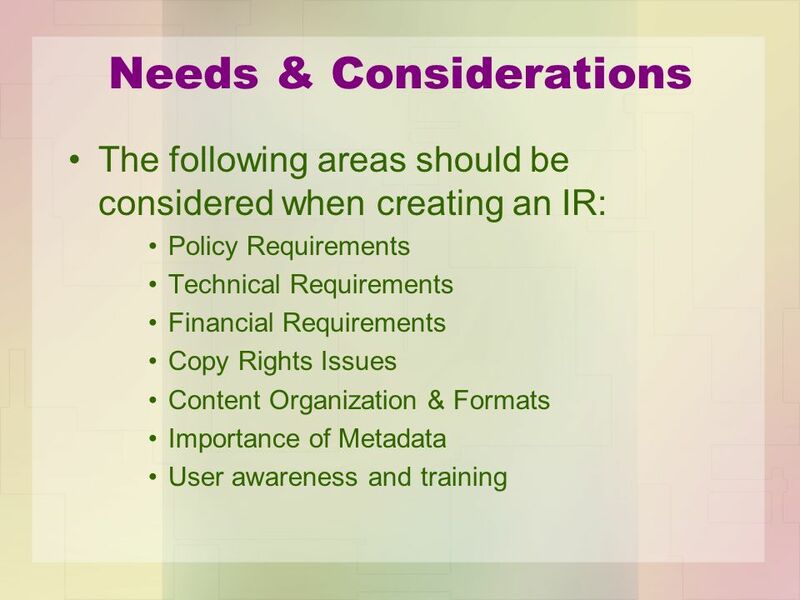 Metadata is a building block to an IR. 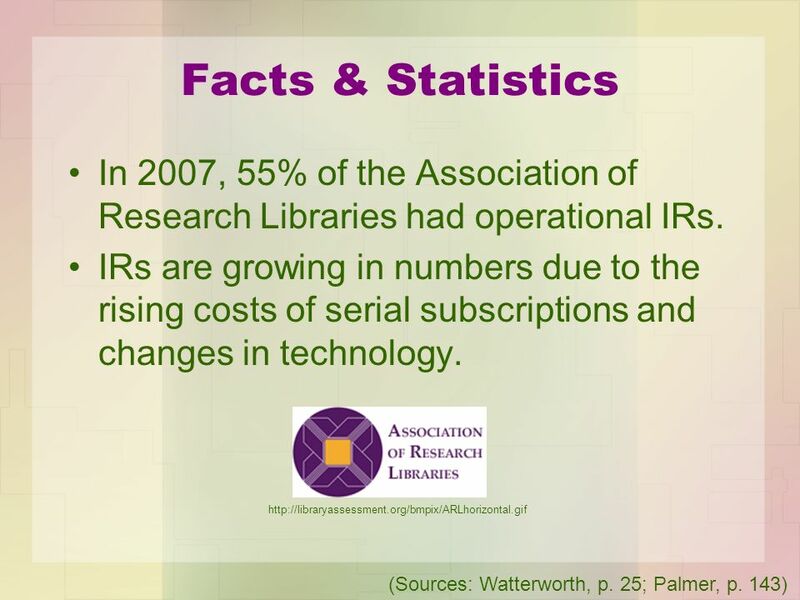 IRs are increasing in numbers since they are more cost effective. 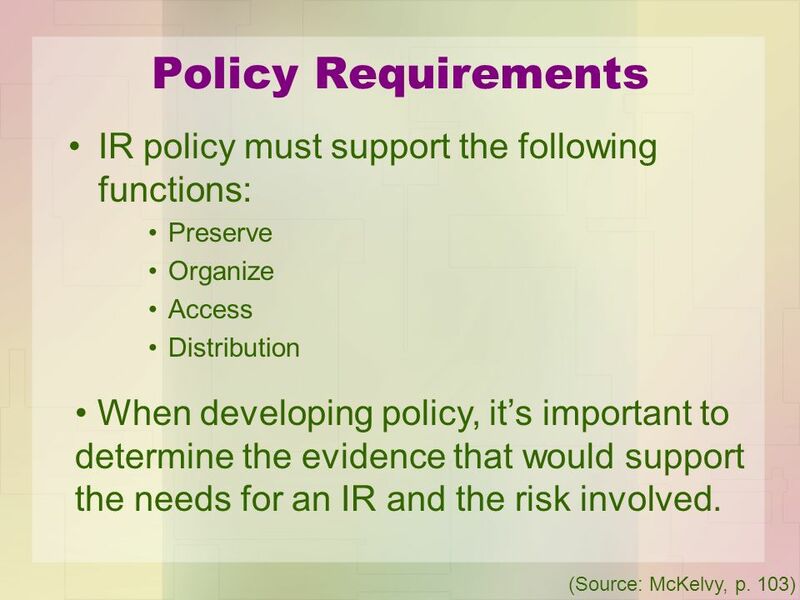 29 Resources Bankier, J., & Smith, C. (2010). 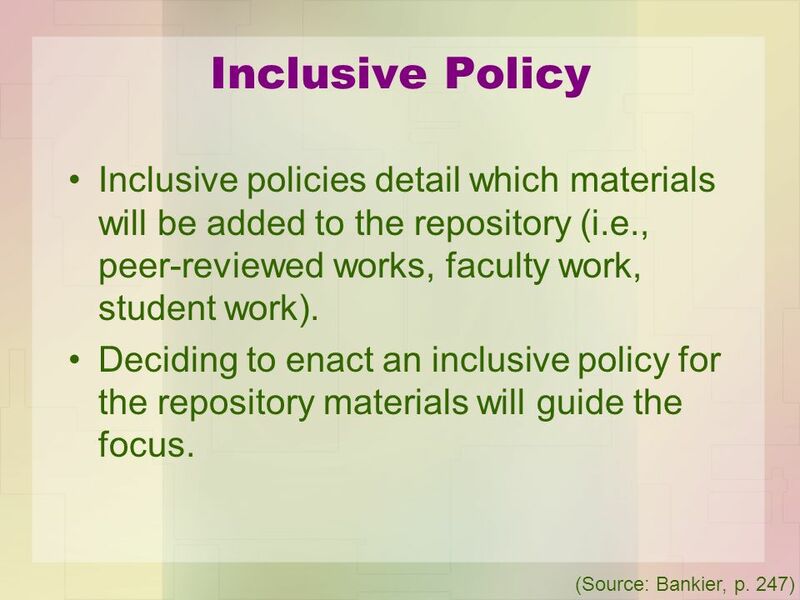 Repository collection policies: is a liberal and inclusive policy helpful or harmful?. Australian Academic & Research Libraries, 41(4), Retrieved from Library Lit & Inf Full Text database. Buehler, M. A., & Trauernicht, M. S. (2007). 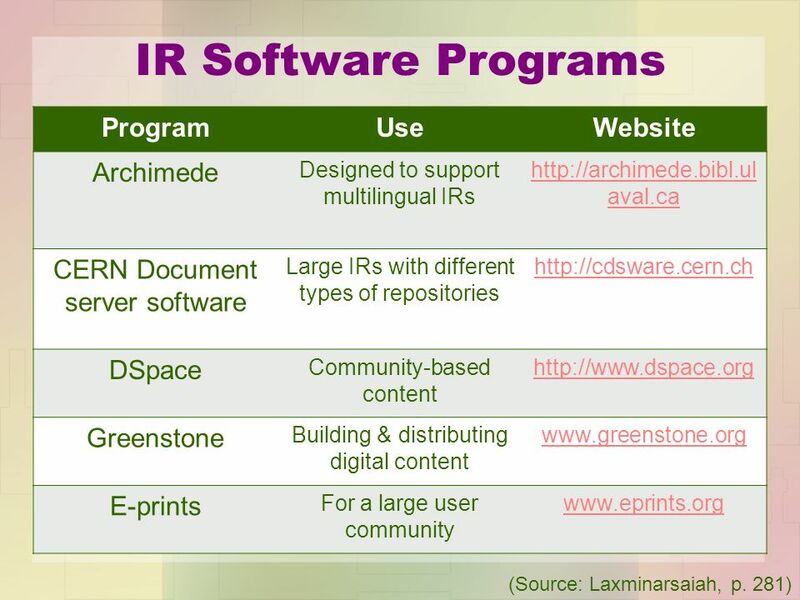 From digital library to institutional repository: A brief look at one library's path. 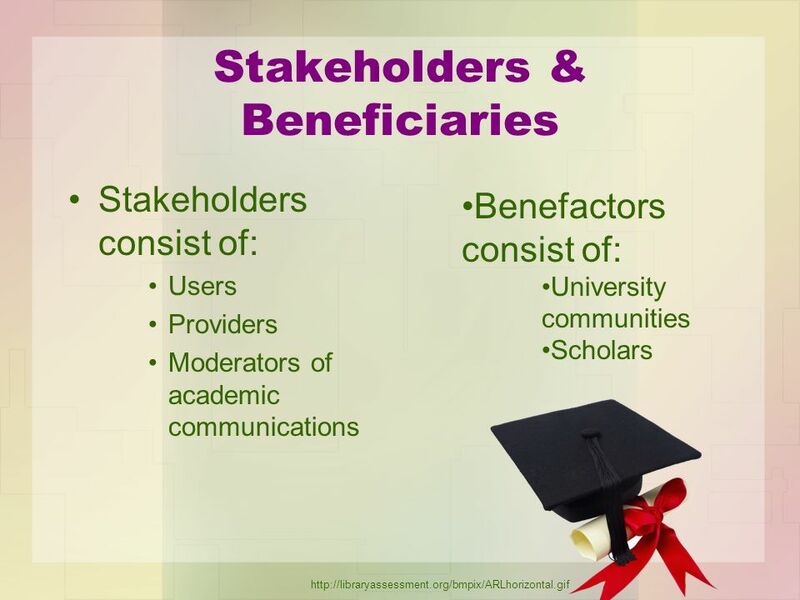 OCLC Systems and Services, 23(4), doi: / CARLABRC. (2002). 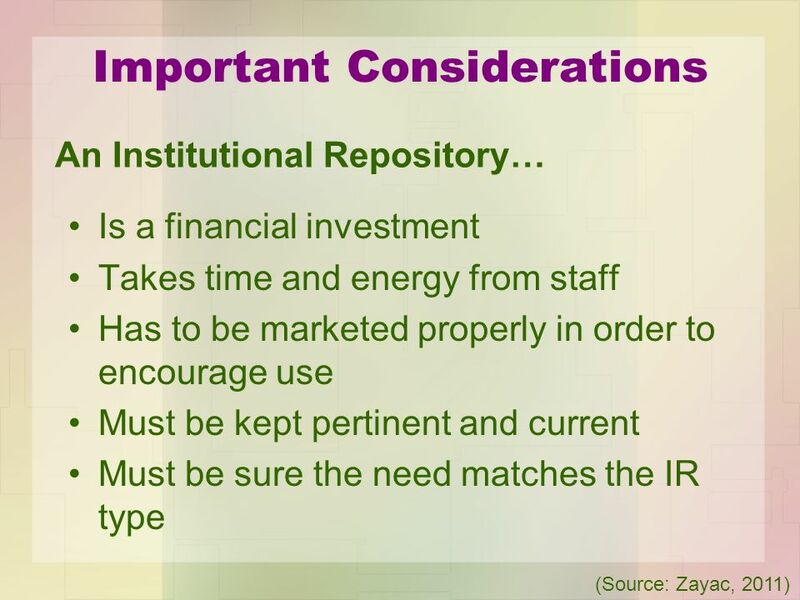 A guide to setting-up an institutional repository. Retrieved from Genoni, P. (2004). 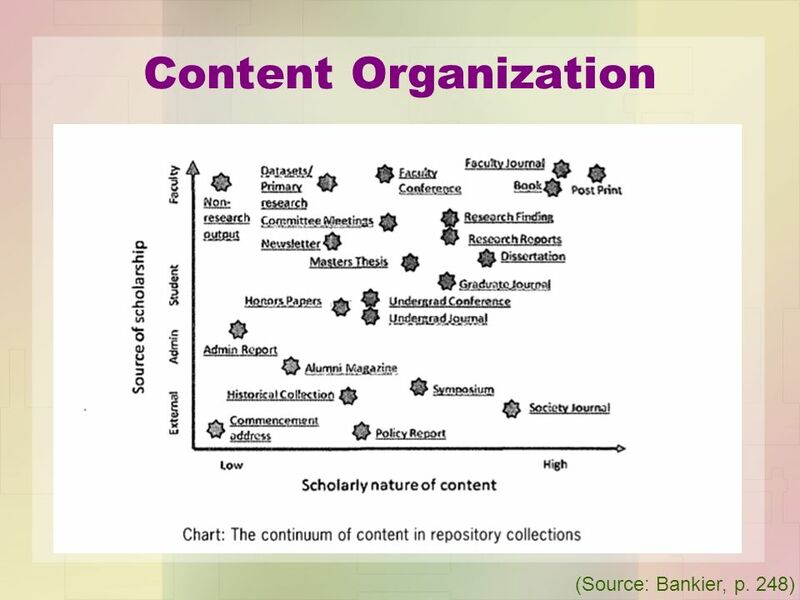 Content in institutional repositories: a collection management issue. Emerald, 25, doi: / Laxminarsaiah, A., & Rajgoli, I. U. (2007). 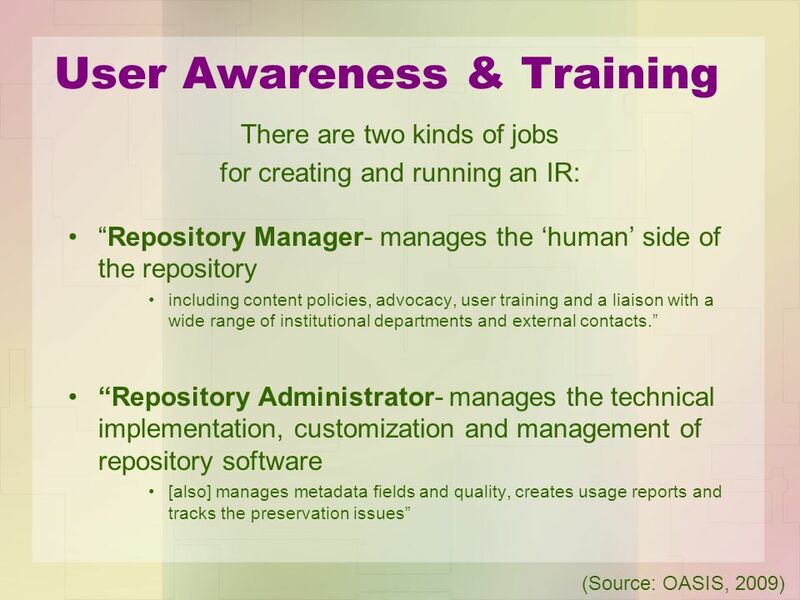 Building institutional repository: An overview. 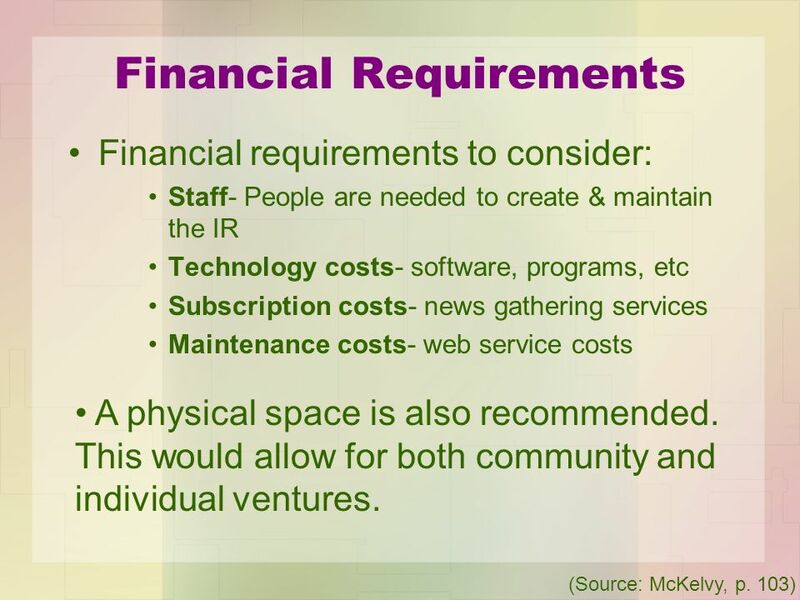 OCLC Systems and Services,23(3), doi: / McKelvy, D. (2011). 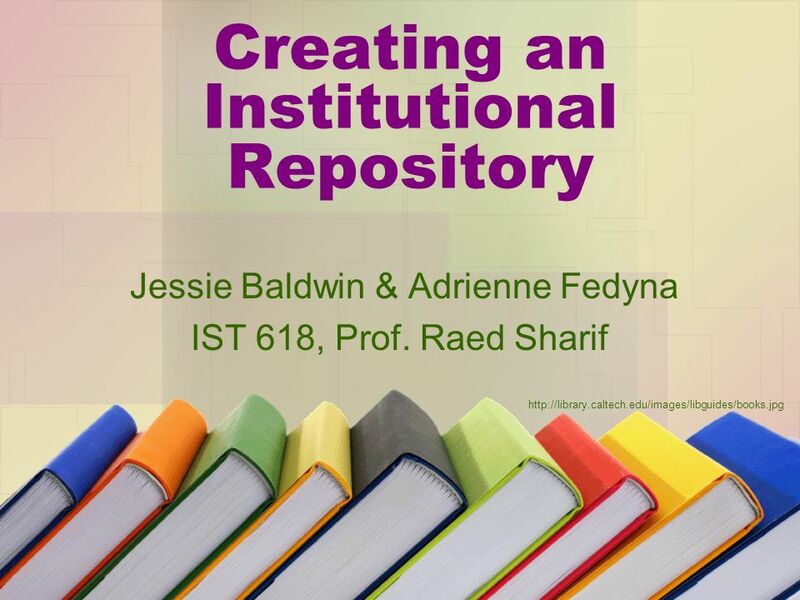 Starting, strengthening, and managing institutional repositories. Journal of the Medical Library Association, 99(1), Retrieved from OASIS. (2009). Establishing a repository. Retrieved from Palmer, C. L., Teffeau, L. C., & Newton, M. P. (2008). 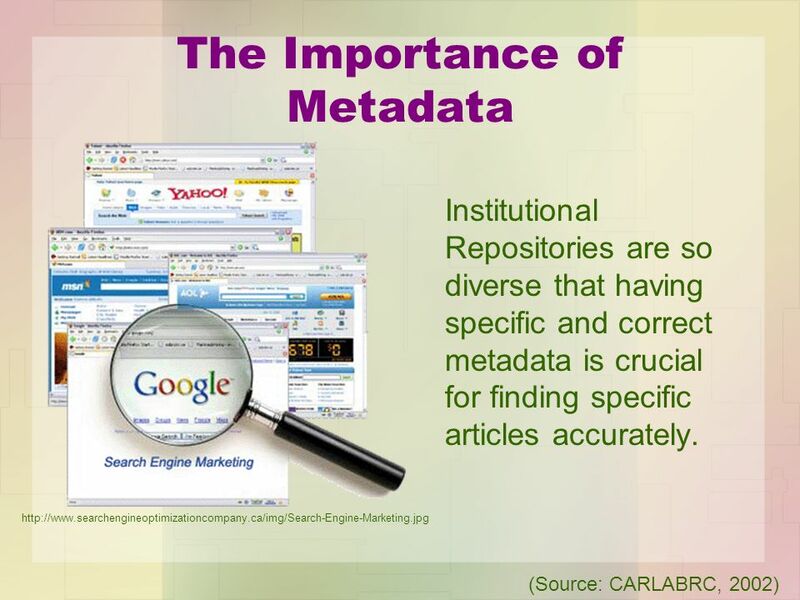 Strategies for institutional repository development: A case study of three evolving initiatives. 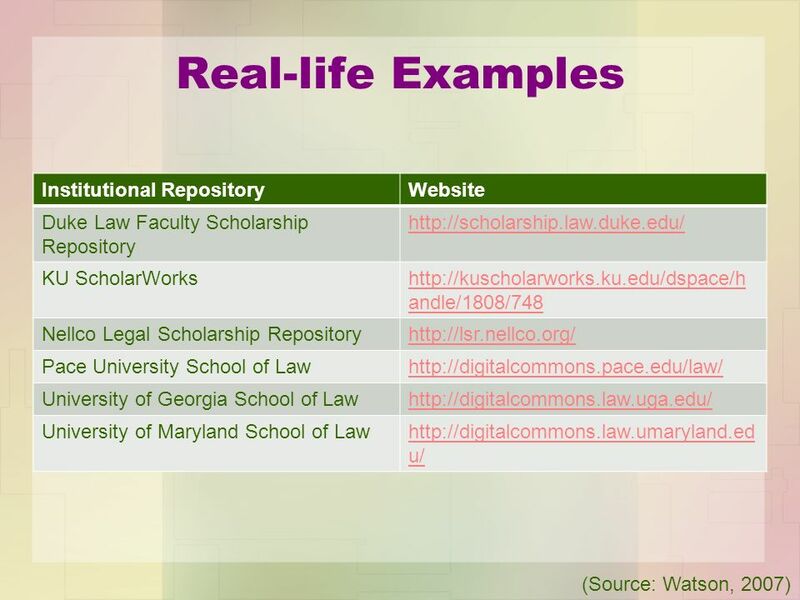 Library Trends, 57(2), Retrieved fromhttp://search.proquest.com/docview/ ?accountid= Watson, C.A. (2007). 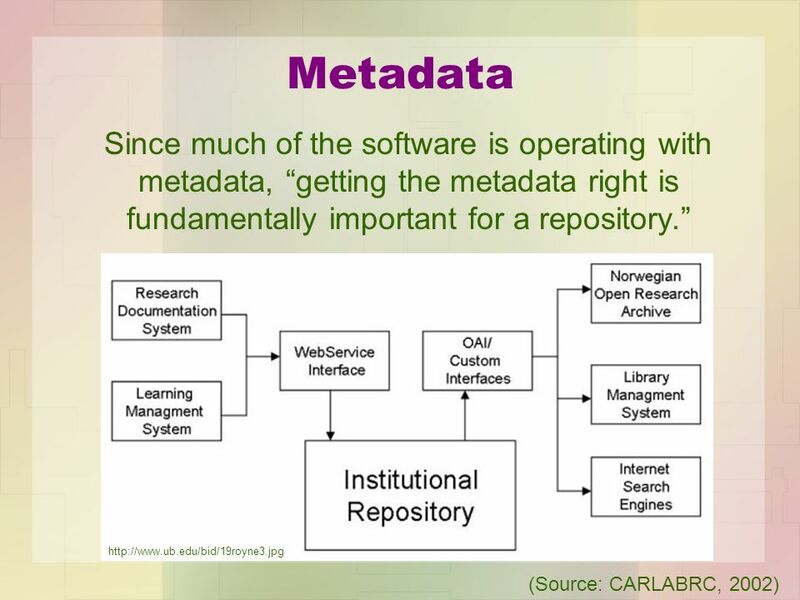 Carpe diem: establish an institutional repository for your organization. LLRX. Retrieved from Watterworth, M. (2009). 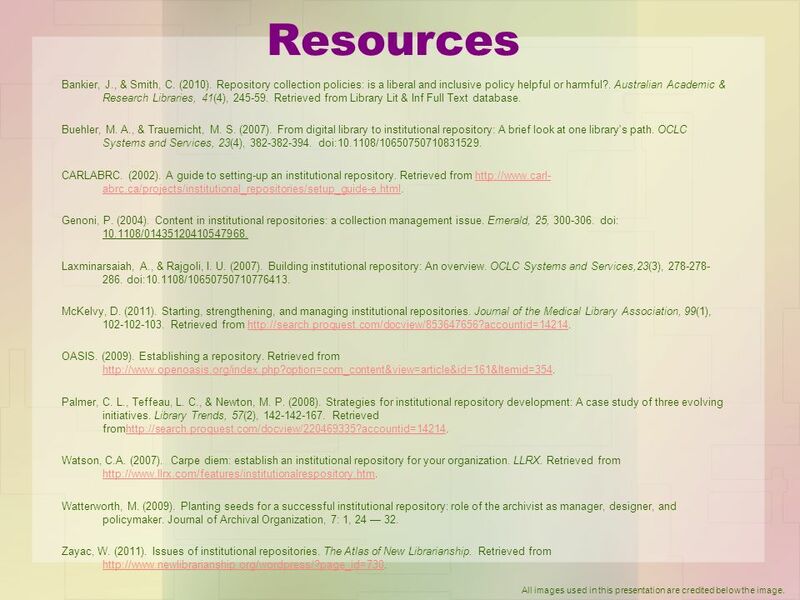 Planting seeds for a successful institutional repository: role of the archivist as manager, designer, and policymaker. Journal of Archival Organization, 7: 1, 24 — 32. Zayac, W. (2011). 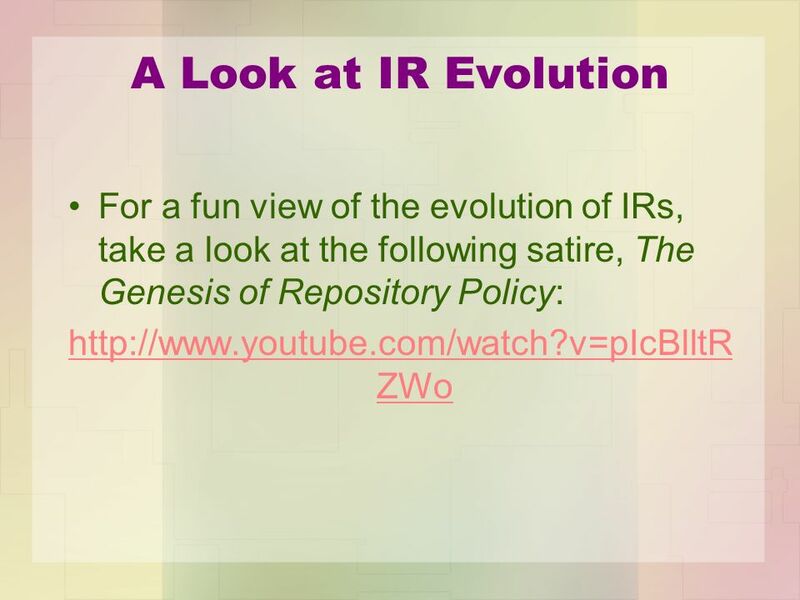 Issues of institutional repositories. The Atlas of New Librarianship. Retrieved from All images used in this presentation are credited below the image. 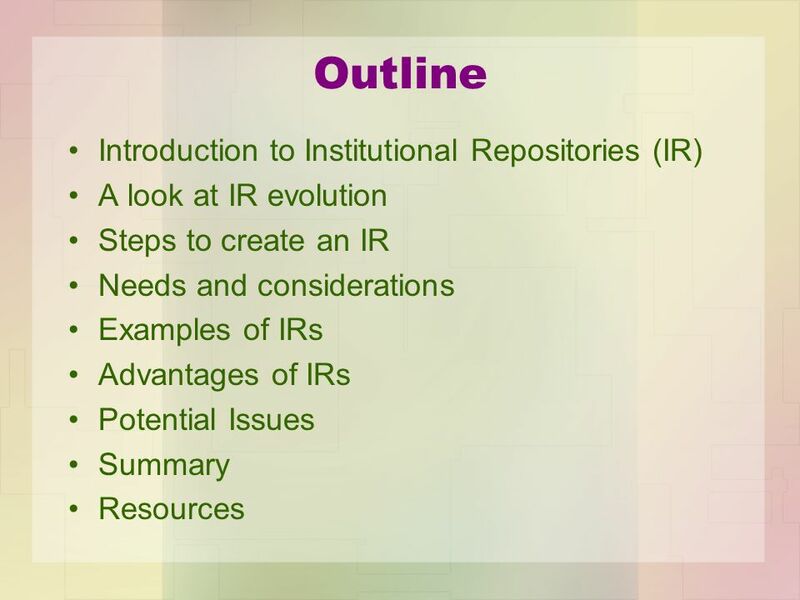 Download ppt "Creating an Institutional Repository"
KNUST Institutional Repository experience by Abednego Corletey. UKCoRR meeting University of Nottingham, November 2007 Mary Robinson SHERPA European Development Officer SHERPA, University of. A Future for UK theses, University of London, Senate House, 22-Jan-2004 E-thesis submission workflow issues Simon J. Bevan Information Systems Manager. Electronic theses - the next stage, 27-Sep-2004, The British Library E-thesis submission – a case study Simon J. Bevan Information Systems Manager Cranfield. Web of Science: An Introduction Peggy Jobe 303-492-4682.